Just off the coast off the northwest coast of Africa, The Canaries are a part of Spain, so close to Europe but feel so far away! Made up of 14 volcanic islands, of which only 6 are famous for surfing. These islands in the Atlantic Ocean are renowned for being shallow, heay and hollow, breaking over reefs. There are more mellow beachbreaks there too for learners. Lanzarote, Fuerteventura, Tenerife and Gran Canaria are very different however each has dramatic scenery and fantastic waves. Lanzarote has a dry climate and is very much a cross between Mexico and the moon! Although quite localised, if you smile and have respect, you can find some great waves to surf. 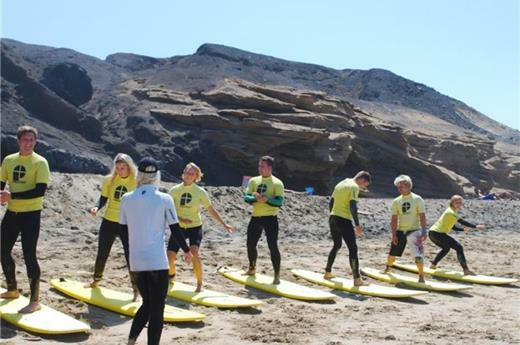 Fuerteventura is a little more commercialised up north in Correlejo with all kinds of waves for all kinds of surfer. Tenerife and Gran Canaria are perfect for surfers that want to enjoy a bit of nightlife and shopping too. Lanzarote has the best quality waves in the Canaries. When the NE winds drop, check out Jameos del Agua which is the longest wave on Lanzarote. The beachbreak of Famara is the ideal place to learn to surf and the northeasterly blows off-shore winds over this spot. Go and explore the island, there are so many great wave to surf, best to hire a car to find the perfect bay depending on the wind. Most famous for its waves. It’s often nicknamed the Hawaii of the Atlantic. A great place to visit in winter, always swell, warm water and sunshine – these barrels are only 3 hours by plane from mainland Europe! You can surf all year round with the best period from September until May. The best months are from October until April as it’s less windy and mostly offshore. The predominant winds blow from the northeast and are occasionally very strong sometimes making surfing conditions difficult. However spots like Famara or La Santa right are well-protected. Spots on the East coast are more inconsistent.